Bug in parallel foor loop: I can probe it! As we know, probes inside parallel loops don't work. That's usually indicated by a slightly greyed-out version of the probe ID in the block diagram (1). However, if I insert a disable structure inside the for loop, I can suddenly have a working probe again (in the Enabled case)! In this picture, probe 3 is a memory I32 probe (old values are shown in the array) and I can actually step through the disabled diagram and get useful readings from the probe. 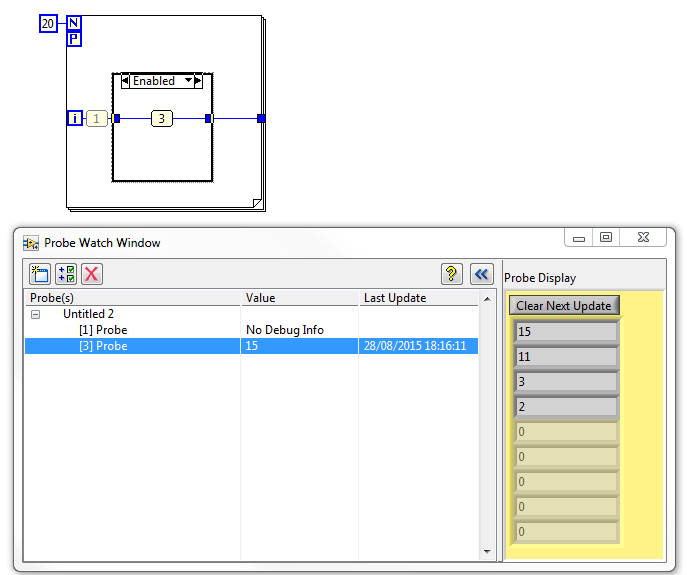 Works in LabVIEW 2014 32 and 64bit. LV15 seems to behave itself. At any rate I would think it is a feature to be able to probe there.